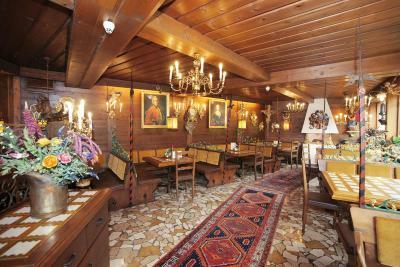 Lock in a great price for Hotel Schloss Fernsteinsee – rated 8.7 by recent guests! We stayed in a Jr. Suite in the castle. We really enjoyed exploring the castle & grounds. Lovely waterfall, beautiful lake with free use of row boats, and the ice cream is best ever!!! Amazing experience to stay in an actual castle suite! Beautiful location with lake access. 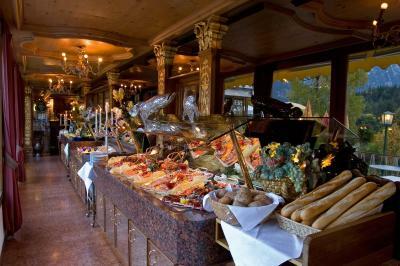 The restaurant was very good with one of the best breakfasts I had in a hotel and staff was flexible and friendly. I highly recommend to book into the castle and not the hotel for the experience. We were met by the wonderful staff with smiles and happiness. I felt like they were our friends-they were so nice. They did all that they could to ensure that we felt like we were the ONLY guests! Our family LOVED our stay and wished we could have stayed longer. So beautiful inside and throughout. The views are magnificent! Excellent service and caring. We hope to come back some day and enjoy the hotel again!! Thank you! great food for all meals. beautiful walks on the property. 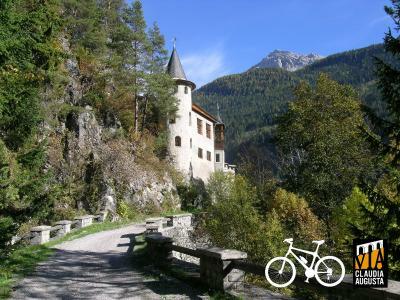 Fantastic location for hiking, eating and motorcycle touring. Loved the routine of breakfast and dinner in the restaurant. Beautiful hikes, romantic rows on the lake, Austrian Alps...wonderful. Very good location in the mountains. The appartment was super and the food was also very good! Hotel very cosy . Amazing views . Lovely lake . Everything. The staff were excellent. The room spotless. Reception couldn't do enough for you. 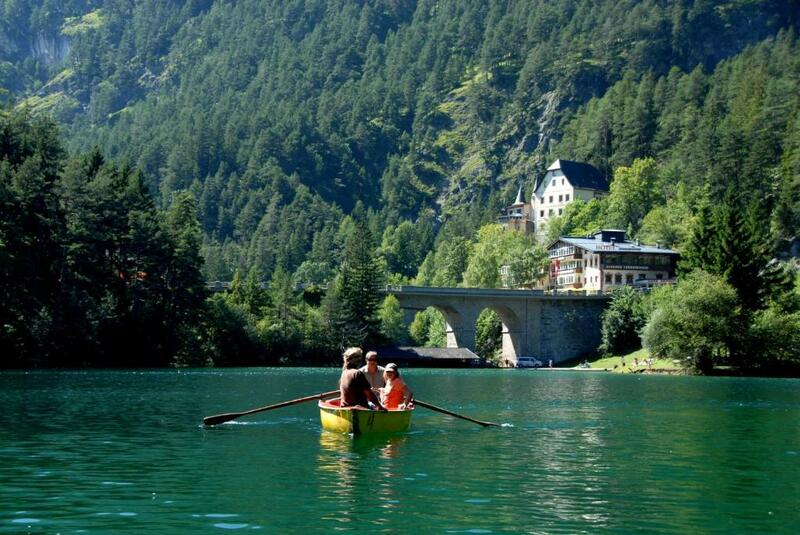 Fantastic nature around - mountains, lake with boats, forests. 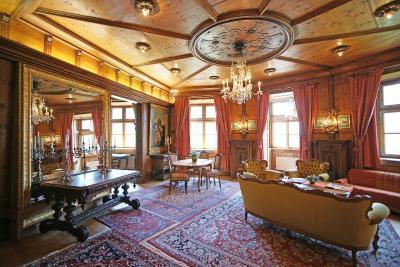 Very comfortable rooms in the castle: fridge, cooker, bath - all needed facilities are there. Very nice and helpful staff. Convenient parking right next to the castle. 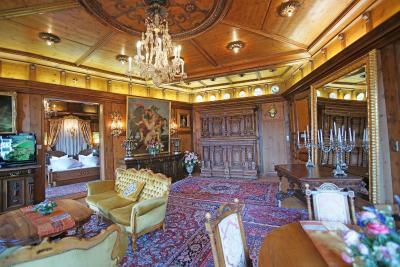 Hotel Schloss Fernsteinsee This rating is a reflection of how the property compares to the industry standard when it comes to price, facilities and services available. It's based on a self-evaluation by the property. Use this rating to help choose your stay! 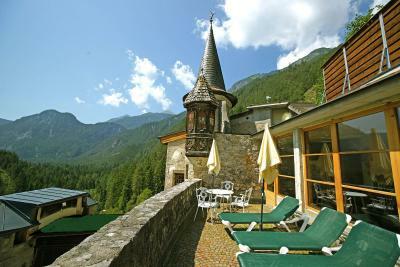 One of our top picks in Nassereith.Hotel Schloss Fernsteinsee with its own castle is set at the foot of the sunny side of the Fern Pass, only a few miles from the Zugspitze Mountain. It features a private 280 0 ft² large area with 2 emerald green lakes. Free WiFi is provided. It features bright rooms with recessed balconies, located in the hotel building, the Villa Lorea annex building or in the castle which is right behind the hotel. Combing modern facilities with a castle country style, the bright rooms with attached bathroom feature a mini-bar and a flat-screen TV. The castle’s restaurants and lounges are furnished in country style and a sun terrace invites guests to relax with a drink outside. 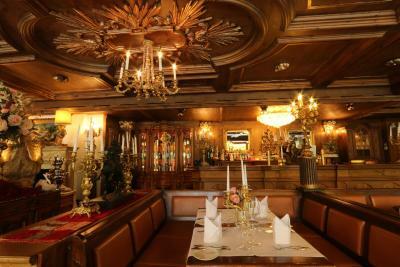 Guests can enjoy the atmosphere of the individually designed parlors and the delicious dishes, from international delicacies to products from the castle’s own farm. Homemade Austrian pastries and ice cream from the own confectionery are a perfect ending to every meal. 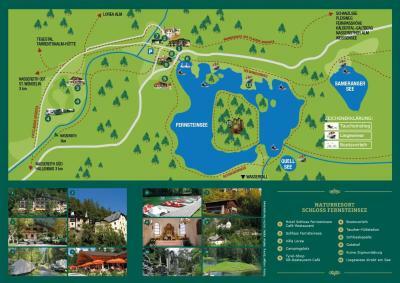 Guests staying longer than 2 nights can dove in Lake Fernstein and Lake Sameranger. Furthermore the use of sauna, boats and mountain bikes is free of charge. 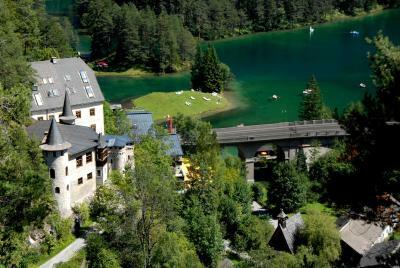 When would you like to stay at Hotel Schloss Fernsteinsee? This room is located in the hotel building and consists of a double bed, a seating area and a bathroom with bath or shower and toilet, a hairdryer, a cosmetic mirror and a towel warmer. 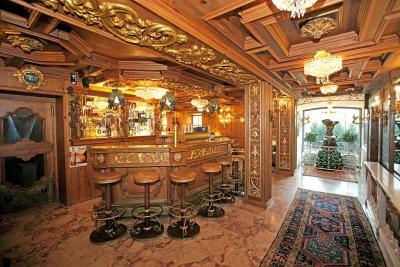 It comes with a mini-bar, a safety deposit box, a flat-screen TV, a CD-Player, a telephone and a radio. A further feature is a glazed balcony. This room is located in the hotel building and consists of a private bathroom with shower, toilet, hairdryer and a cosmetic mirror, a safety deposit and a seating area. It also features a CD-Player, a radio, a telephone and a flat-screen TV. 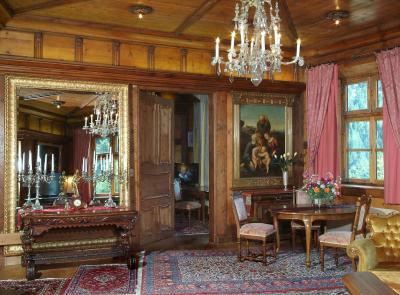 This suite is located in the castle and features antique furnishings. It comes with a bedroom and a living area, a luxurious bathroom with bath and toilet, a towel warmer, a hairdryer, and a cosmetic mirror, and a kitchen. A flat-screen TV, a radio, a safety deposit box and a telephone are featured. The castle is located right behind the hotel building. Check-in, breakfast buffet and dinner take place at the hotel. 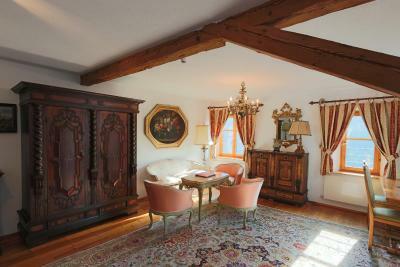 This suite is located in the castle and features antique furnishings. It comes with a bedroom and a living area with a sofa bed, a luxurious bathroom with bath and toilet, a towel warmer, a hairdryer, and a cosmetic mirror, and a kitchen. A flat-screen TV, a radio, a safety deposit box and a telephone are featured. 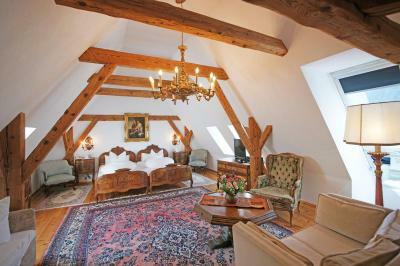 This spacious suite is located in the castle and features antique furnishings. It comes with a bedroom and a living area with a sofa bed, a luxurious bathroom with bath and toilet, a towel warmer, a hairdryer, and a cosmetic mirror, and a kitchen. A flat-screen TV, a radio, a safety deposit box and a telephone are featured. 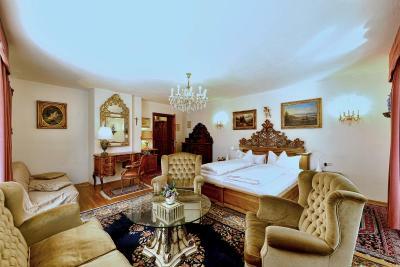 This spacious and luxurious suite features antique furnishings and is located in the castle and comes with 2 bedrooms and a small tower bedroom, a living room, 2 bathrooms, one with bath and one with shower, and each with toilet, hairdryer, towel warmer and a cosmetic mirror. 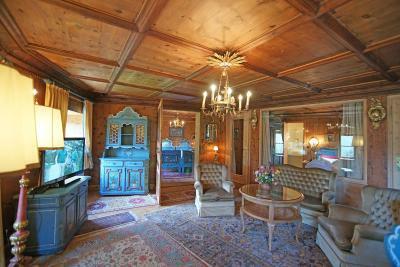 A kitchen, 3 flat-screen TVs, a radio, a safety deposit box and a telephone is also featured. 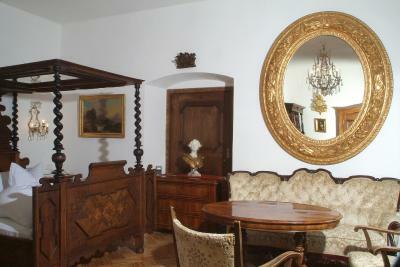 This suite is located in the castle and is decorated in a rural style. It comes with a bedroom, a small tower bedroom and a living room with a double bed, 2 luxurious bathrooms, one with bath and one with shower, and each with toilet, hairdryer, towel warmer and a cosmetic mirror. A kitchen, 2 flat-screen TVs, a radio, a safety deposit box and a telephone are featured. This double room features a glazed balcony, a combined sleeping and living area with a double bed and a sofa bed, a flat-screen TV, radio, a mini-bar, and a bathroom with a bathtub or a shower, a towel warmer, a hairdryer and a cosmetic mirror. This apartment is located in an annex building, a 5-minute walk from the main building. Check-in, breakfast buffet and dinner take place in the main building. This junior suite features a terrace and a glazed balcony, a combined sleeping and living room with a double bed and a sofa bed, a flat-screen TV, a radio, a mini-bar, and a bathroom with bath tub or shower, towel radiator, hairdryer and vanity mirror. This suite in the caste comes with antique furniture. It has 1 bedroom, a living area with a sofa bed and a kitchen. 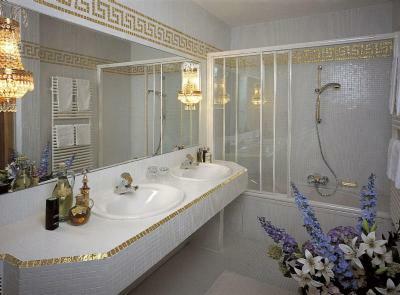 The luxurious private bathroom has a bath, toilet, towel warmer, hairdryer and make-up mirror. A flat-screen TV, radio, safe and telephone are also featured. 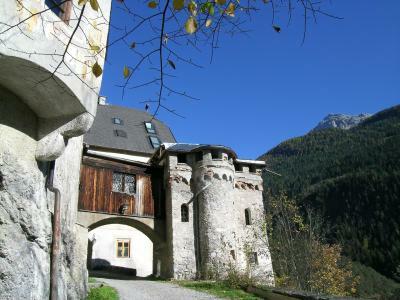 The castle is located directly behind the hotel building. Check-in, buffet breakfast and dinner are in the hotel. 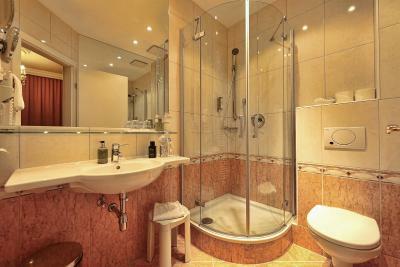 This spacious suite features a living room with a double bed, a luxurious bathroom with bathtub, toilet and hairdryer. It is equipped with a comfortable kitchen, Flat screen TV, safe, WIFI, Mini-bar with complimentary water and a little welcome snack. 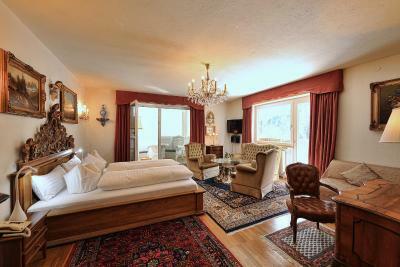 This suite is suitable for 2 person and you can use the sun terrace of the castle free of charge. 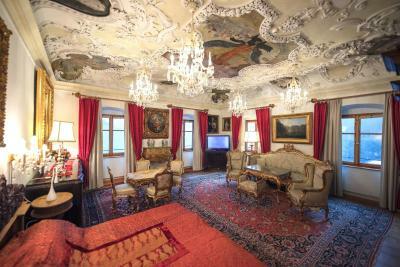 House Rules Hotel Schloss Fernsteinsee takes special requests – add in the next step! One child from 4 to 6 years is charged 30 % of the room stay per night and person in an extra bed. One child from 7 to 12 years is charged 40 % of the room stay per night and person in an extra bed. 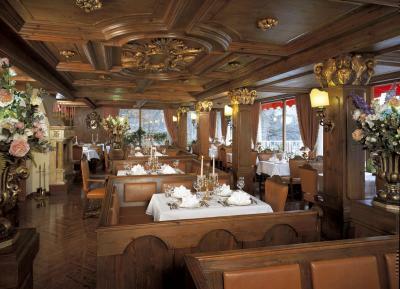 Hotel Schloss Fernsteinsee accepts these cards and reserves the right to temporarily hold an amount prior to arrival. Please note that the property and the restaurant are open from May to October. 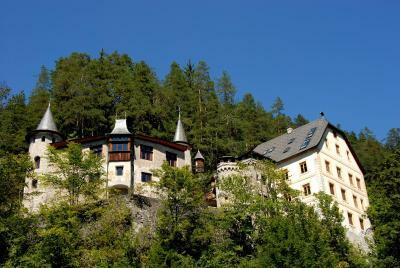 Please inform Hotel Schloss Fernsteinsee of your expected arrival time in advance. You can use the Special Requests box when booking, or contact the property directly using the contact details in your confirmation. It’s a castle! You definitely feel special staying in the suite. Beautifully furnished. Amazing location. Very good breakfast. Everything was wonderful!!! The whole place is amazing!!! In suite for a couple you expect to have one large blanket instead of 2 small ones. The motorway is close, but in fact it never disturbed us - so it is not a problem. The room was just too hot and even with balcony door open and balcony window open a little. 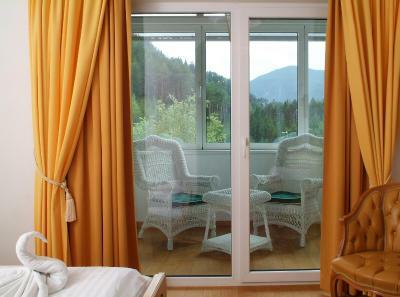 Very nice hotel set in the most amazing setting, with stunning views and beautiful environment. 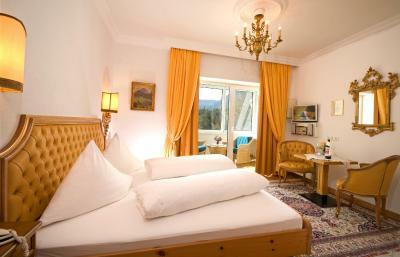 The hotel staff are friendly and helpful and the room very clean and comfortable beds. Good buffet breakfast and the restaurant menu is varied and reasonable in price. The hotel has a lovely sunbathing and swimming area nearby on the edge of the lake. Lots of walks from the hotel, which are a must to enjoy the location. The road going past the Schloss is incredibly busy with lorries, it’s not very relaxing to sit on the cafe terrace. The fridge hadn’t been emptied in the apartment and the old food smelt pretty horrible. In spite of asking staff to take it out, it was still left there, making the kitchen really unpleasant to go into. It was a shame I didn’t stay in the main building, I think it would have had more atmosphere. The restaurant on the other side of the road isn’t owned by the hotel I don’t think. It’s more of a truck stop service station with a shop attached selling baseball caps with long straggly biker hair attached. Far from romantic! The lake and mountains make this an amazing setting. Recommend going for the short walk around the lake and going onto the island to find the ruins. The apartment in Villa Lorea was large and comfy with a nice balcony. Staff on reception and in the cafe in the evening were friendly and helpful. While the experience to stay in the castle is amazing, accessibility could be an issue for some people. No lift of course and the way on foot down to the hotel and back up from your breakfast/meals can be tiresome with many steps. Very nice stay in the appartement in the Villa. Good diner and breakfast. Beautiful lake Fernsee in which we enjoyed a swim in the clear fresh water. Love to come back.